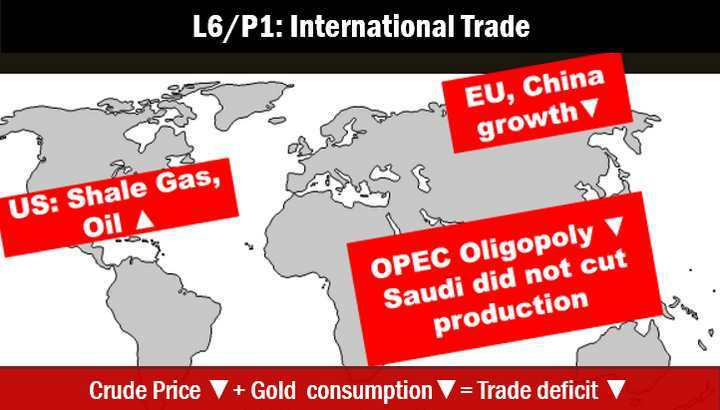 L6/P3: Foreign Trade Policy 2015: region wise strategy? On 17th April 2015, I started the session on International trade subpart- Foreign Trade Policy 2015. Two prime reasons for declined trade deficit during 2014-15. 3 prime reasons why crude oil prices have declined. 3 existing measures to curb gold consumption in India. 3 new measures given in budget-2015 to reduce gold imports in India viz. 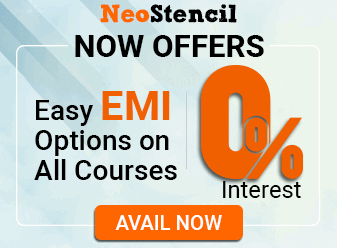 : Gold monetization scheme, Sovereign Gold bond scheme, Ashok Coins. India’s top imports and exports according to the new economic survey. External challenges faced by Indian exporters: quantitative easing and multilateral trade agreements. Legal, taxation and policy related issues hampering the growth of Indian goods and services exports. Way ahead: Foreign trade policy 2015 (…continued in next part of the video). 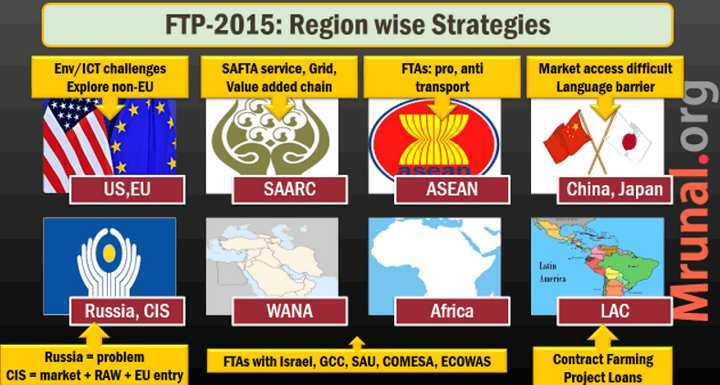 Basics of foreign trade policy 2015: Who, what, When- targets and deadlines? Five stages of trade agreements: preferential trade agreement (PTA), Free trade agreement, multilateral trade agreements, common market /custom union, economic union. 3 important multiregional trade agreements for Mains GS2:- Trans-Atlantic, Trans-Pacific and RCEP. TATIP: transatlantic trade and investment partnership between USA and European Union. Salient features and how does it affect India’s economic interests. TPP: transpacific partnership between USA, Canada and other nations. Should India join TPP just like Australia, Japan et al are planning? RCEP: Regional comprehensive economic partnership agreement. List of participant countries, opportunities for India. Discuss the significance of ASEAN-FTA and RCEP on India’s economic interests in Asia. 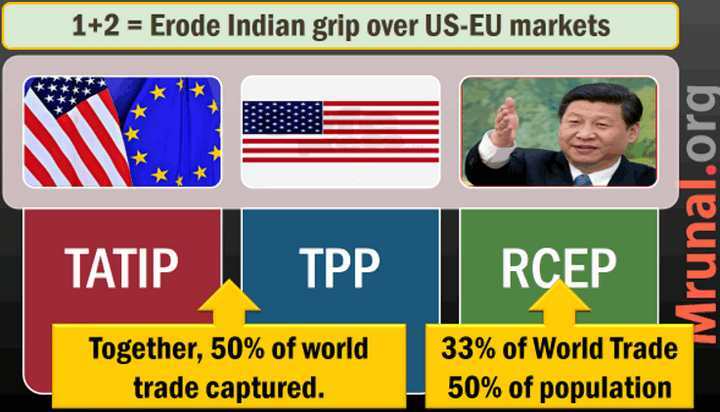 TPP and RCEP- the Manifestation of Economic rivalry between US and China, will have profound impact on India’s foreign trade. Elaborate. How do EU data securities laws prevent entry of start-up companies from India? SAARC trade: present scenario and suggest reforms to boost exports? Who is India’s largest trading partner among SAARC nations? ASEAN countries: free trade agreement in goods, services and investment. Arguments in favour and against. What is duty inversion? How does it impact Indian economy? Importance of ASEAN transport connectivity for Indian exports? India-Myanmar-Thailand trilateral highway. India-China bilateral trade and projected figures for 2016. Challenges faced by Indian IT, Pharma and Agriculture exporters to enter in Chinese market? India-Japan: why infrastructure investment is high but bilateral trade is low? India-Russia: why strategy relations are good but trade relations have bad? What are the challenges faced by Indian exporters in Russia? India-CIS countries: opportunities as market and raw material supplier, but constrains in transcontinental connectivity. India- WANA (West Asia and North African countries)- opportunities for Indian exporters and the need for early conclusion of trade agreements. India-Africa: opportunities for “project exports”, why do we give technical assistance to least developed countries? Need to finalize trade agreements with SACU, COMESA and ECOWAS. India-LAC: Latin America and Caribbean countries. Why PTA with MERCOSUR has been a non-starter? Why should India purchase larger farms in Latin America? Bigger picture: proposed Indian strategy to improve trade relations with 8 regions of world, under foreign trade policy 2015. Sir, i request you to please resume PIN (March -april) as exams lined up..state services etc..
Ur lectures r really goldmines of information. It only depends upon the the user how to use them. Those who generally complaint upon the lectures and want articles don’t listen to it carefully and patiently . Plz keep the great work going!! You can’t understand others problems because u can understand Hindi well but I am not. It requires lot of mobile data for the video lectures who can afford it for them where cost of living is very high in Delhi. If you are happy continue but try to obey others feelings. i am unable to dowload power point slides on my android mobile. Video lectures are more useful than articles.They are entertaining as well was thorough in coverage,full with FFID (facts,figures,information and data). Please continue them. I will request mrunal sir to launch,if possible,coverage of modern India in few lectures.The focus should be on critical analysis as demanded by the current exam trends and not only on events.Just a suggestion. Sir IWRA is right Plz help & guide us in coverage of modern India. This section in is full of uncertainty in terms of nature of questions & content. we feel trouble what to prepare & how to develop answer & what contents to include in modern India section. So Plz Plz enlighten us…………. sir please your lecture also provide in written. because i can’t watch due to device. SBI associate PO final results out! Check now! Mrunal ji, there are many followers of ur site from TN also. Request u to Provide lecture in English, So that it may helpful for everyone from south. yes use youtube downloader software. Sir plz upload the remaining economy lectures along with the geography lectures. Its been more than 2 weeks sir we have been w8n for ur lectures. Very lucid and interesting. When will the next lecture be uploaded? Sir when are you uploading further lectures(L6 P4 onwards) of Economy ? Geography k sath Economy ki class bhi band ho gayi kya ? ?